ETA Process Instrumentation offers professional calibration and repair of portable and fixed instruments for safety, industrial hygiene, environmental, and process applications. We have over 40 years of expertise in gas detection and gas analysis. We can repair or calibrate any brand of gas detection equipment. We offer on-site service in MA, NH, ME, VT, RI, CT, and Upstate NY. All work is traceable to NIST standards, and all documentation and calibration reports are ISO 17025 compliant. Depot service is available nationwide for portable instrumentation. We offer quick turnaround times and ship to meet your needs. You can even drop off and pick up instruments at our offices if you are close by. For depot repair, complete this form. Service plans are available for annual, quarterly, or more frequent calibrations. 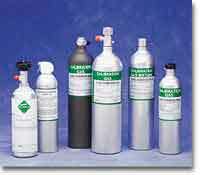 Calibration Gases are available in single gas or mixes for any portable instrument – all gases are NIST traceable . We buy our gases directly from a laboratory and can save you 20-30% compared to buying from instrument manufacturers. We offer all types of regulators – fixed flow, multi flow, and demand flow; and tubing for regulators and for sampling systems. Recycle your empty cylinders and receive a $10.00 credit towards a new cylinder – the green and cost efficient alternative.